It’s my first time stepping into RED, the Chinese restaurant in Pullman Kuala Lumpur City Centre and like many first-timers here, I’m taken aback (in a good way) by its stunning setup. 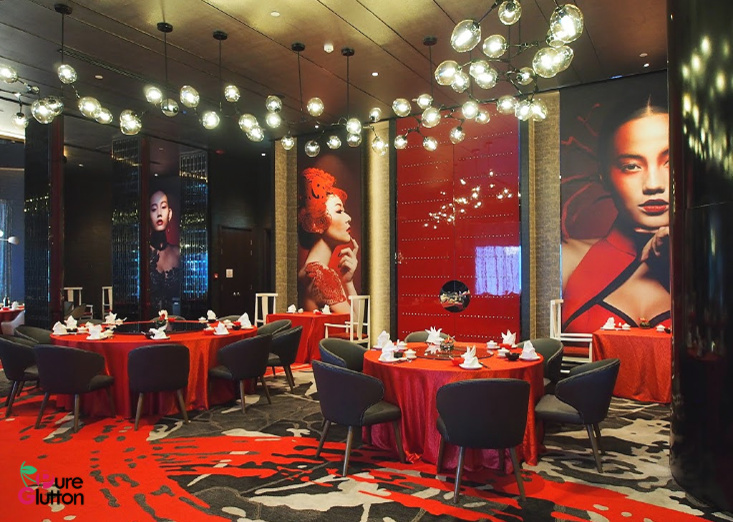 Its striking black and red theme is like a breath of intense fresh air, quite unlike the traditional oriental deco favoured by many Chinese restaurants. 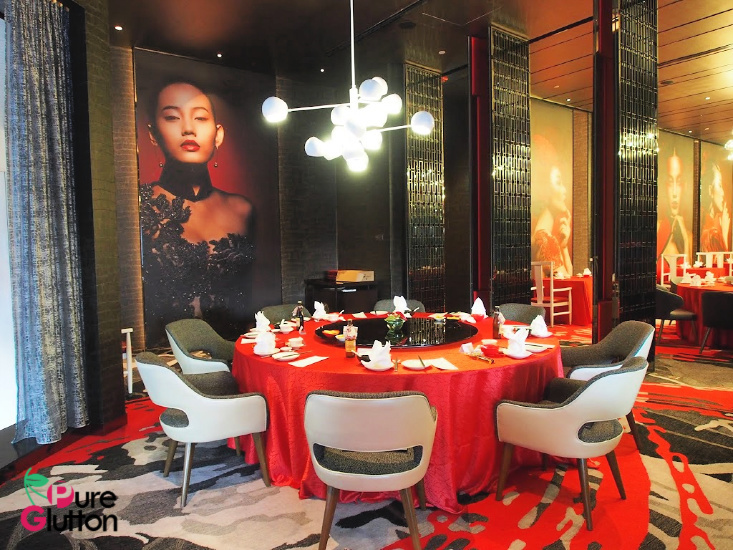 Backed against the stylish walls are giant-sized photos of gorgeous designer cheongsam by couture designer Carven Ong, adding on an air of mysterious elegance, so much so that I’m reluctant to peel my eyes off the entire chic scene. 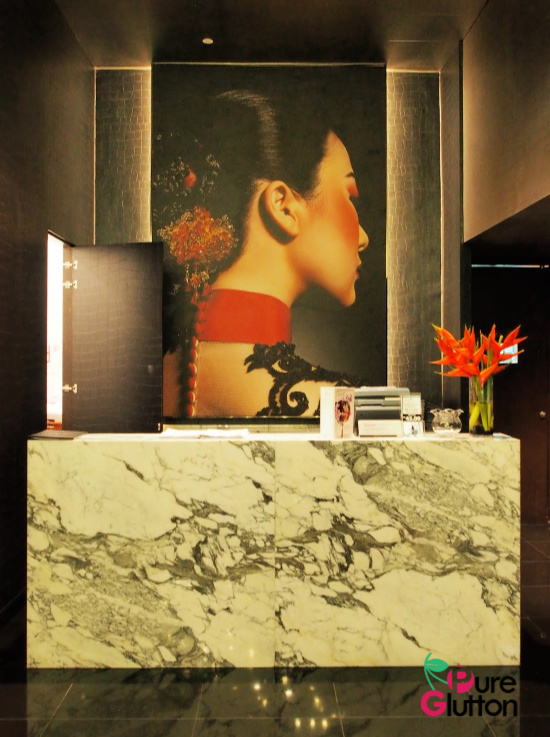 Every intricate detail of the cheongsam is captured brilliantly by renowned photographer Kenny Loh and these images, so resplendent in their form and colours, are a perfect backdrop for this modern classy restaurant. The theme for this year’s lunar new year celebration in RED is “A Blast from the Past”. Setting the tone for this nostalgia, old-school lanterns and a pop-up grocery store with 1970’s snacks and paraphernalia are in full display at the restaurant. 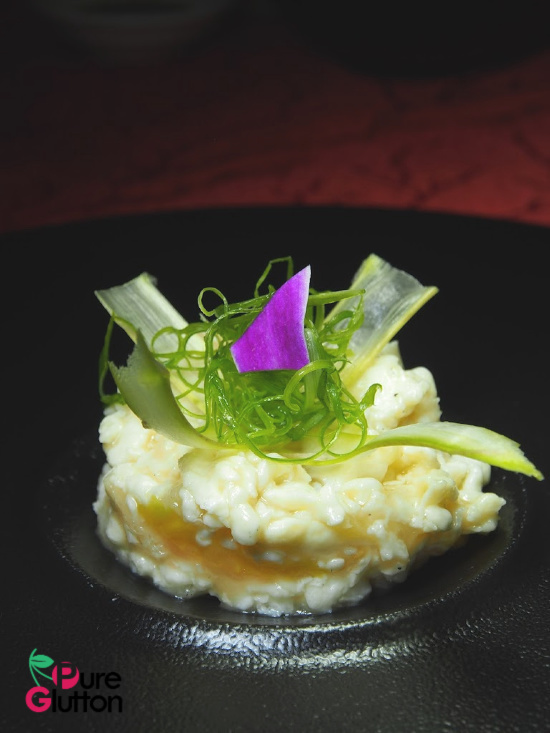 From now until 19 February 2019, Chef Mak Kar Leong and his team will be serving special 8-course meals to usher in the Year of the Pig. There are 3 set menus available, ranging from RM1,388 to RM1,888 per table of 10 pax. However, for smaller groups or even just couples, there is option to order a la carte items which Chef Mak has specially curated. I like the innovative approach by Chef Mak and his team towards the contemporary style of dining in RED. There is a refreshing lightness in the food served here, at least from what I see in the special a là carte dishes listed under “Chef’s recommendations”. 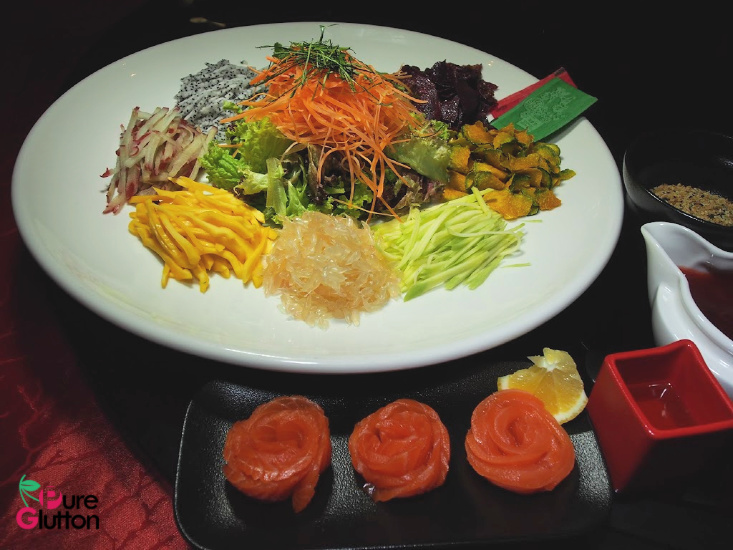 We start with Yee Sang, a must-have in any lunar celebratory meal. Guests get to choose how their Yee Sang is served. 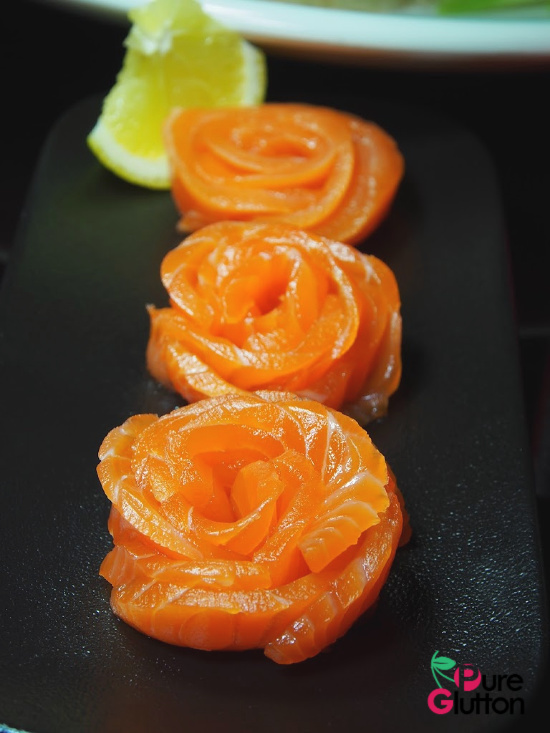 Fresh fruits and garden greens are the base, guests choose 1 house-made sauce (strawberry, sesame plum or pineapple plum) and 2 toppings ranging from fresh salmon, tuna, jellyfish to tempura prawns or crispy whitebait. 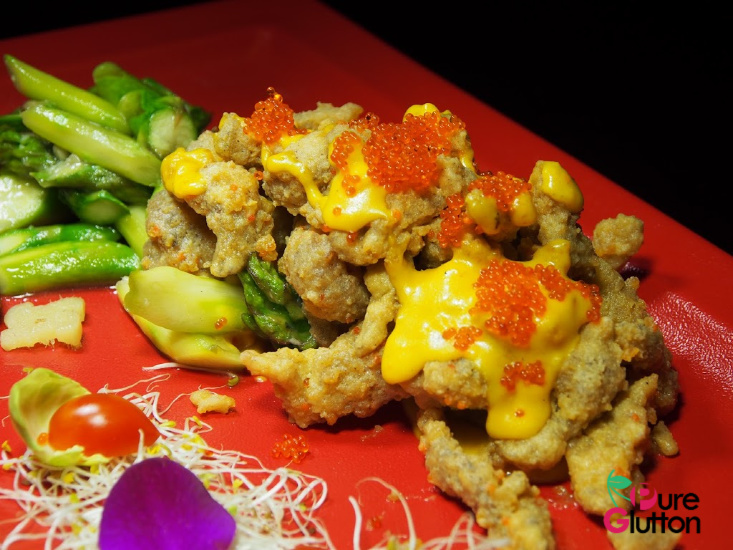 For a more deluxe experience, add in supplemental premium items like truffles, abalones or soft shell crabs. 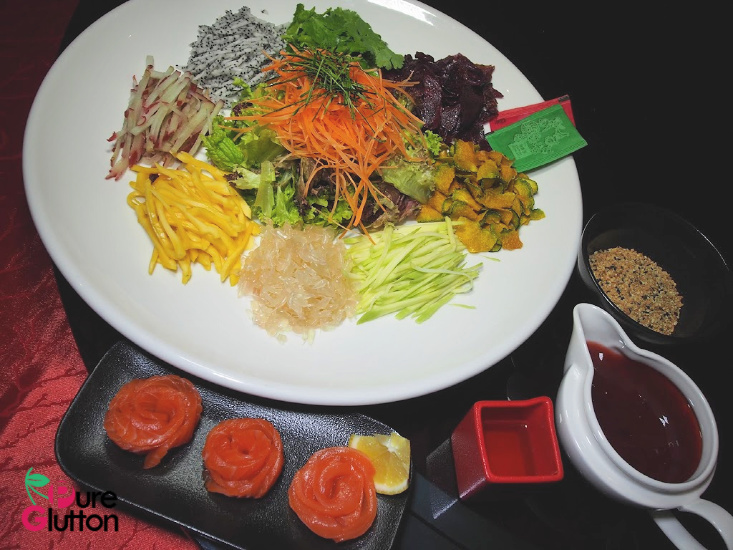 So, there you have it – your Yee Sang can be simple or elaborate, it’s all customized to your preference. Full of sweet umami-ness, the Double-boiled Sea Whelk Soup in the vibrant red bowl is tantalizingly delicious to the last drop. 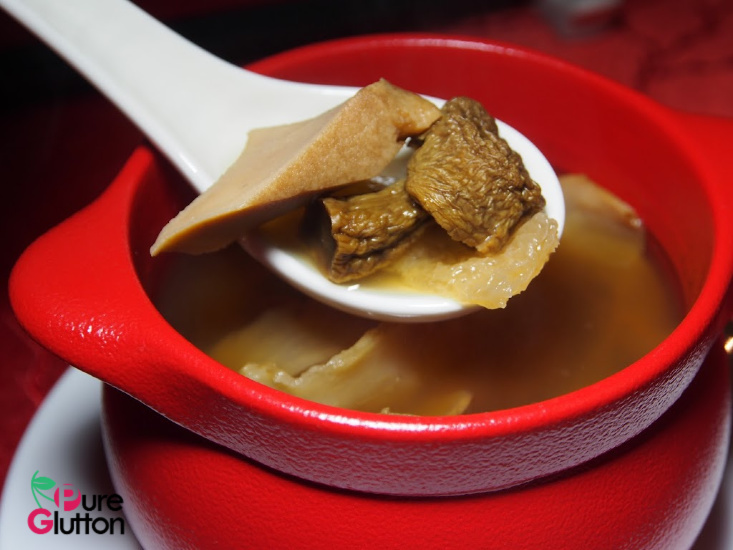 With robust flavours from conpoy, winter melon and mushrooms, the piping-hot soup is both nutritious and satisfying. Table linen and crockery in black and red totally match the deco and the bold colours enhance the food presentation to the hilt. 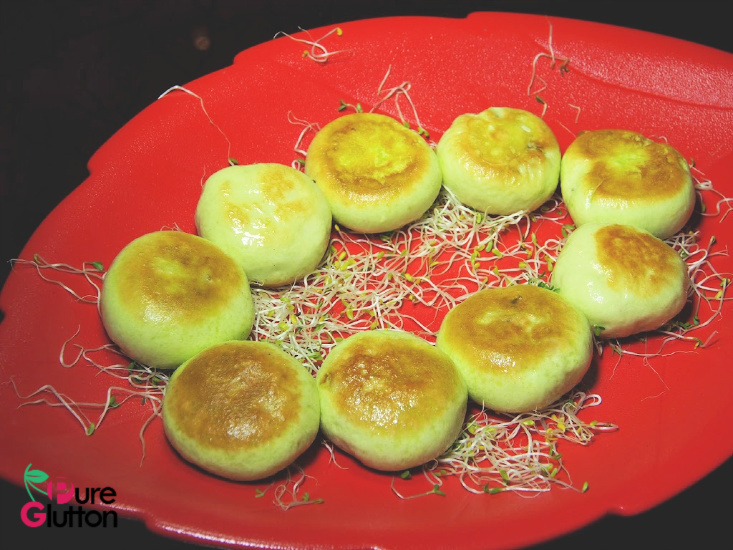 Cooking methods are kept simple, using less oil which all contribute to more natural and healthier eats. This is evident in the Scrambled Eggwhites dotted with tomatoes and bamboo fungus. I love the creamy cottony texture of the eggwhites, balanced nicely with the crunchy fungus. In comparison, the Stir-fried Mantis Shrimp with fish roe comes with heavier flavours but the asparagus does a good balancing act here. 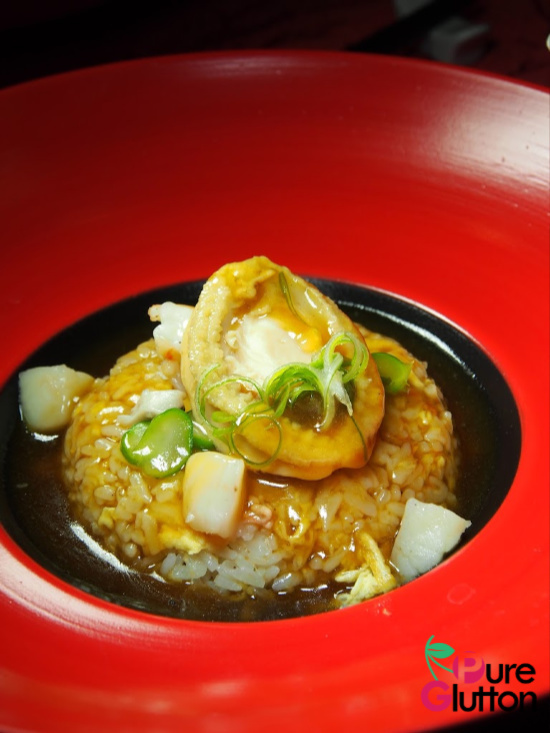 The Fujian-style Seafood Fried Rice is tasty and the whole abalone served with it gives it that extra posh experience. To round off the meal on a sweet note, the Pan-fried Chinese Pudding with Purple Sweet Potato is an interesting change from the usual “nian gao”. I like it that it’s not overly sweet and the sweet potato filling is not cloying. 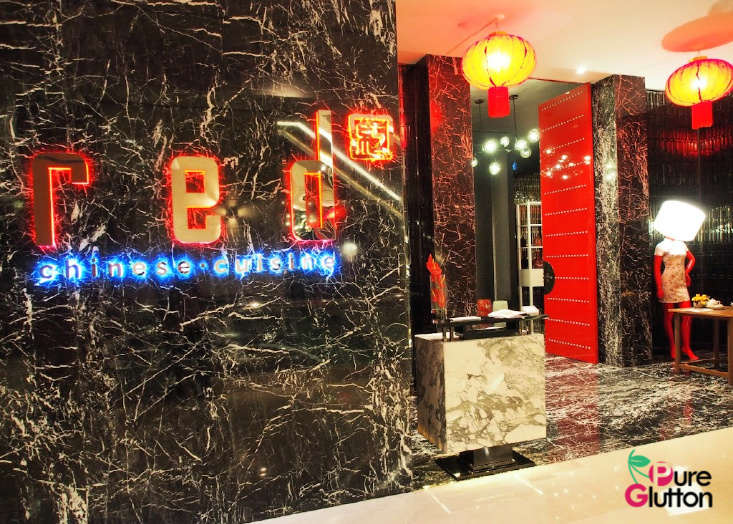 RED remains open throughout Chinese New Year, so do check out this chic restaurant with the auspiciously red deco and savour light avant-garde Chinese cuisine with refreshing twists.